With all the buzz spreading about Galaxy Note 5, let us talk about Samsung’s wearable business and how the company plans on tightening its grip in this particular market. The company’s upcoming flagship wearable, named Galaxy Gear A has its specifications revealed, and in comparison to the others, they are looking very impressive. Let us hope that when the device gets officially launched, it does not disappoint in the battery tests, like all smartwatches have done so far. The latest report states that Galaxy Gear A, which is also known as Orbis, will be running the company’s homegrown Exynos 3472 SoC. The chipset will comprise up of a 1.2 GHz dual-core processor and a Mali-400 MP4 GPU. It is surprising to see that wearable is going to be sporting a 4 core GPU. Coming to the processor; while there were no details present which processor was running inside the wearable, it will belong to ARM Cortex, since the GPU running inside it also belongs to the British chip designer. Additionally, Galaxy Gear A will also be running 768 MB of RAM and 4 GB of on board storage. Providing battery life to the product will be a 250 mAh battery. Now here is where we start developing hiccups. A dual-core processor running inside a wearable that will only feature a 250 mAh battery will most likely drain at the same rate as Apple Watch and all of its competitors. However, one critical detail that we did not mention was that Galaxy Gear A will be running Samsung’s Tizen operating system, featuring a new UX that has been specifically designed for wearables. 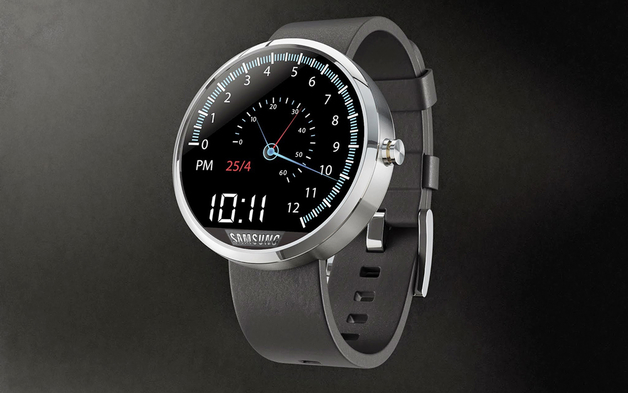 Furthermore, the smartwatch will have a Bluetooth 4.1 module to interact with smartphones and tablets. It is possible that Samsung also rolls out a Wi-Fi capable variant, which sports an 802.11 n adapter, and will provide support for Wi-Fi Direct too. Similar to the company’s high end handsets, Galaxy Gear A will sport a Super AMOLED display with a resolution of 360 × 360 pixels. So far, there are no details concerning the wearable’s screen size, so we are going to wait for that. According to the source, it is possible that Galaxy Gear A will be announced alongside Galaxy Note 5 and Galaxy S6 Edge Plus. At this current time, this is all the information we have with us. Looks like we are going to have to wait for Galaxy Note 5’s announcement if we are going to see what Galaxy Gear A has to offer to the wearable market.